This paper uses a new set of online research tools to develop a detailed study of the public debate over proposed legislation in the United States designed to give prosecutors and copyright holders new tools to pursue suspected online copyright violations. 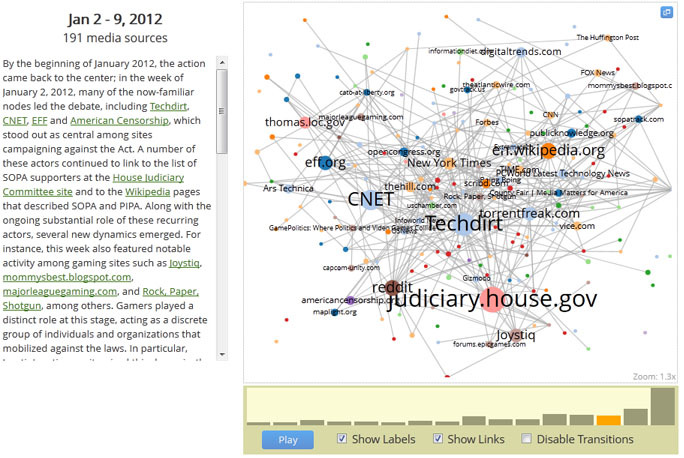 For this study, we compiled, mapped, and analyzed a set of 9,757 stories relevant to the COICA-SOPA-PIPA debate from September 2010 through the end of January 2012 using Media Cloud, an open source tool created at the Berkman Center to allow quantitative analysis of a large number of online media sources. This study applies a mixed-methods approach by combining text and link analysis with human coding and informal interviews to map the evolution of the controversy over time and to analyze the mobilization, roles, and interactions of various actors. This novel, data-driven perspective on the dynamics of the networked public sphere supports an optimistic view of the potential for networked democratic participation, and offers a view of a vibrant, diverse, and decentralized networked public sphere that exhibited broad participation, leveraged topical expertise, and focused public sentiment to shape national public policy. We find that the fourth estate function was fulfilled by a network of small-scale commercial tech media, standing non-media NGOs, and individuals, whose work was then amplified by traditional media. Mobilization was effective, and involved substantial experimentation and rapid development. We observe the rise to public awareness of an agenda originating in the networked public sphere and its framing in the teeth of substantial sums of money spent to shape the mass media narrative in favor of the legislation. Moreover, we witness what we call an attention backbone, in which more trafficked sites amplify less-visible individual voices on specific subjects. Some aspects of the events suggest that they may be particularly susceptible to these kinds of democratic features, and may not be generalizable. Nonetheless, the data suggest that, at least in this case, the networked public sphere enabled a dynamic public discourse that involved both individual and organizational participants and offered substantive discussion of complex issues contributing to affirmative political action. 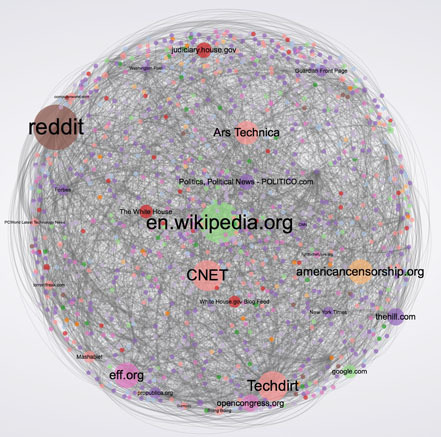 Drawing from the paper Social Mobilization and the Networked Public Sphere: Mapping the SOPA-PIPA Debate, this interactive visualization maps the evolution of a public controversy by collecting time slices of thousands of sources, then using link analysis to assess the progress of the debate over time. The interactive maps are available on this page. Media Cloud, a joint project of the Berkman Center for Internet & Society at Harvard University and the Center for Civic Media at MIT, is an open source, open data platform that allows researchers to answer complex quantitative and qualitative questions about the content of online media. Using Media Cloud, academic researchers, journalism critics, and interested citizens can examine what media sources cover which stories, what language different media outlets use in conjunction with different stories, and how stories spread from one media outlet to another. Additional information about the collection of this data can be found in the methods section of the paper.